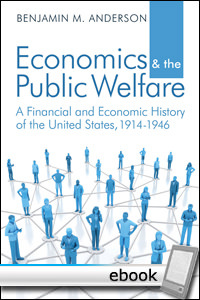 Here is a contemporaneous account of the economic history of the first half of the 20th century, by an American adherent of the Austrian School. Covered in these pages is the inflation of World War I and following, the 1920s boom, and the onset and calamity of the Great Depression. Anderson was not only a trained economist but an accomplished journalist who wrote with a flair for exciting detail. He is objective about the facts but passionate in his analysis of cause and effect. He not only recorded the events; he participated in them as a working free-market economist. When this book appeared in 1948, it did not receive the attention it deserves, owing to the popularity of Keynesian theory. Today, however, we can see the enormous value of Anderson's account, as proof that some economists did indeed understand the disasters wrought by central planning and central bank monetary management. It's no wonder that Mises and Hazlitt thought so highly of him and his work. 69: A Verdict on the S.E.C.